The lower end of Tonto Creek canyon is reached by side road FR 417, which winds up a small ravine, over a ridge then down into a saguaro-filled valley, crossed by dirt tracks leading to the scattered houses and farms of Gisela. The road becomes unpaved, bends to the north and reaches a T junction in front of a field; the track to the left curves around some private land then over a few dusty dry washes before being blocked by a gate, which is the usual parking area for the hike to the canyon and a popular stopping place, judging by the amount of litter. There is a bin and a notice asking visitors to be tidy, but in vain. Beyond the gate, the road continues a little way further, past some big cacti, and ends at a corral beside a private residence, situated in a wooded area just after the point where Tonto Creek exits the end of the main canyon and meets a smaller tributary (Houston Creek). A sign to 'Swim Hole' marks the start of a public path through the bushes, reeds and trees that line the side canyon, and this comes out of the undergrowth after a few minutes onto a stony beach beside the main creek and opposite a gauging station. Update (2009) Perhaps because of the litter, it appears the local landowner has closed the access point. It may still be possible to reach the narrows by parking a couple of miles south in Gisela village, walking a short distance east to the creek and then hiking northwards towards the canyon. Not far upstream the creek forms a deep pool about 20 meters long beneath a short, pretty narrow section and a waterfall. This is the popular swimming site and also has lots of litter, but there is no more beyond since very few people explore further up canyon. 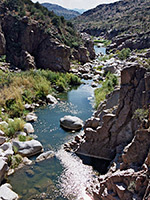 Depending on water levels, climbing ability and the desire to swim through other pools, it is possible to walk many miles further. After the Swim Hole the canyon alternates between open stretches and enclosed deep-water channels, then soon the latter start to predominate and the walls become very steep. The rocks are colored various shades of red, grey and white - usually smooth polished granite at water level then jagged, crumbling, darker rock higher up. In some places pools can be avoided by climbing the cliffs above, though the rocks tend to be quite unstable, covered by cacti and other thorny plants, so remaining at water level is generally easiest. In the summer months, when the exposed cliffs become too hot to touch, wading through the pools is the only option and also provides welcome relief from the heat. Two miles into the canyon, a big pool beneath a 10 foot waterfall marks the end of the easiest section; beyond are more pools and cascades, and a tributary on the southeast side (Soldier Creek) then a long flooded section of around 100 meters. After this the canyon opens for a while at an area known as McDonald Pocket then constricts once more and remains narrow for most of the next 10 miles upstream to the Hellsgate Trail crossing.